Report by fact-finding committee calls for a SIT probe on police officials who “deliberately failed” to stop the attacks on Dalits. 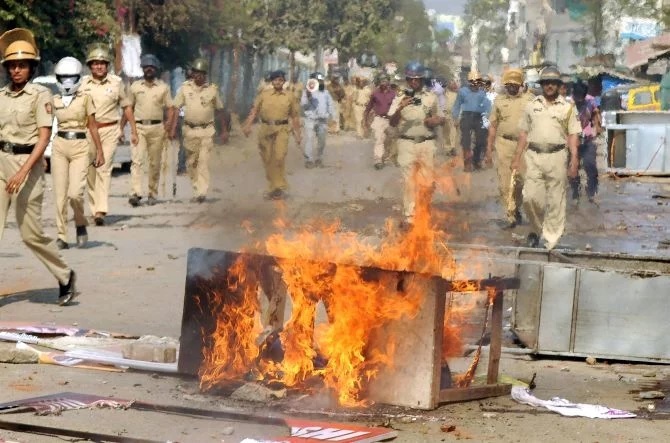 The Bhima Koregaon violence which broke out in the first week of January this year was a “pre-planned” attack by Hindutva groups on Dalits, concluded a nine-member fact-finding committee led by Siddarth Dhende, deputy mayor of Pune Municipal Corporation. According to the report, which was submitted to the Pune Rural police last week, a year-long conspiracy hatched by Milind Ekbote and Sambhaji Bhide, both leaders of Hindutva outfits, and deliberate failure of both the police and administration, had resulted in the violence in which one Dalit was killed and scores injured. On January 1, many members from Dalit communities visited Bhima Koregaon village, 30 km from Pune, to mark the 200th anniversary of a battle in 1818, where British troops, comprising mostly Mahar (a Scheduled Caste) soldiers, had defeated the Brahmin Peshwa-led Maratha army. While lakhs of Dalits gathered at Vijay Stambh, a memorial pillar representing the victory of Dalits, mobs of Hindutva groups attacked them. The report stated that Ekbote had founded the Dharmavir Sambhaji Maharaj Smruti Samiti, 15 years ago, to distort the history of Govind Gaikwad – a Mahar who had performed the last rites of Sambhaji Maharaj, son of Shivaji Maharaj. “A board near Sambhaji Maharaj’s samadhi detailing the work done by Govind Gaikwad was replaced with a new one, and KB Hedgewar’s photo, RSS founder, was put up. There was no need to put up Hedgewar’s photo at the samadhi. It was a deliberate move that created a rift between the upper and backward castes. If the police had taken action, the untoward incident could have been avoided,” the report stated. On December 30, 2017, Ekbote held a meeting and a press conference at Sonai Hotel, Perane Phata. “In the meeting, he appealed for observing January 1, 2018, as a ‘black day’. Plans to observe a bandh in Bhima Koregaon and nearby villages were also discussed in the meeting. On December 30, 2017, the villagers of Bhima Koregaon decided to observe a bandh on January 1, and submitted a letter to this effect to the police,” the report stated. “From 30 December to 31 December, a message was going viral on social media that Bhide will hold a meeting on 1 January and everyone should gather at the village of Vadhu.” The team interviewed nearly 400 eyewitnesses and collected nearly 200–250 photos, videos, audio clips before submitting the report to the police. While the Maharashtra police registered multiple complaints and first information reports in relation to the violence, they did not further on the findings submitted by the report, instead, 10 activists -Sudhir Dhawale, Surendra Gadling, Mahesh Raut, Shoma Sen and Rona Wilson -- were arrested on June 6, and Varavara Rao, Gautam Navlakha, Sudha Bharadwaj, Vernon Gonsalves and Arun Ferreira were taken into custody on August 28, based on a complaint by Tushar Damgude, Pune-based businessman and follower of Sambhaji Bhide, who complained that the speeches during Elgar Parishad on December 31, 2017 had incited violence. Dhende opined that these arrests by the Pune police are being done to protect Hindutva leaders like Ekbote and Bhide and other Hindutva groups. “We have given proof that it was pre-planned violence, and had nothing to do with the Elgar Parishad, as had been alleged. The history of Bhima Koregaon and surrounding areas shows that Dalits and Marathas did not previously have animosity. But Bhide and Ekbote twisted the historical narrative to create communal tension. We have mapped a chronology to establish the involvement of Hindutva forces,” Dhende was quoted as saying. As per the report, while the Hindutva groups hatched the conspiracy which turned into a riot-like situation, local police and politicians from different parties including Nationalist Congress Party, Shiv Sena and the ruling Bharatiya Janata Party “fostered” the violence. The committee found that both Ekbote and Bhide made several attempts to alter Bhima Koregaon’s history. “They are trying to replace the history by Hindutva ideology and create feelings of hatred towards Scheduled Castes,” the report stated. While Ekbote was arrested and later released on bail, based on one of the complaints in this regard, Bhide has been left untouched by the Pune police. The role of police during the violence was slammed by the report. It recommended the suspension and a Special Investigation Team (SIT) probe on the police officers answerable in the concerned areas, DSP Ganesh More, Shikrapur police station inspector Ramesh Galande, Lonikand police station’s Sarjerao Patil and several others who were able unable to stop the attacks on the Dalits.